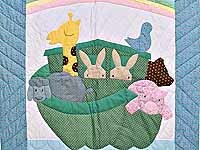 A charming baby quilt! Look at that cute lamb and those adorable bunnies! Bright and beautiful fabrics. Well made by a Lancaster County, Pennsylvania Amish woman. Back is covered with a solid ivory colored fabric. What a lovely little quilt! Excellent appliqué work and gorgeous, rich colors. The contrast between the center fabrics and the surrounding fabric is stunning. Made in Lancaster County, Pennsylvania by an Amish woman. Includes a sleeve for a hanging rod. Lovely! A favorite C Jean Horst design now available in a size small enough to fit on most any wall. 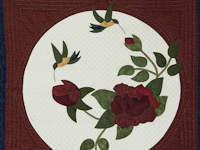 Beautiful Navy border with appliqué roses in burgundy and humming birds just like the ones in her rose garden. 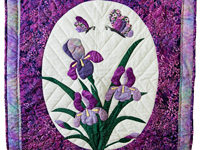 Made here in Lancaster and quilted by an Amish lady using 8 fine hand quilted stitches per inch. The backing has a beautiful light ivory floral print and the corner tag has all the documentation recording the name of the pattern, the maker, the fabric content, the origin and a notation - made in America. A little beauty that can be easily added to your collection. Notice the fine quilting and also close quilting in the center of the quilt. It's a beauty and an eye catcher. A fantastic throw that will be the highlight of any room. An original design by C Jean Horst who has also selected the gorgeous fabrics. Well made by Lancaster Amish woman -- note the hand quilting with 7 - 8 stitches per inch and fine appliqué work! Signed with embroidery on front by C Jean Horst. A brilliant work of art ! Extra special work! Lovely! A favorite C Jean Horst design now available in a size small enough to fit on most any wall. 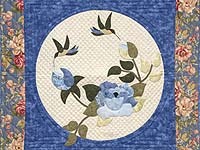 Beautiful appliqué roses and humming birds just like in her garden. 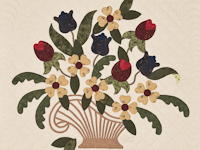 Made here in Lancaster and quilted by an Amish lady using 8 fine hand stitches per inch. The backing has a beautiful light burgundy print and the corner tag has all the documentation recording the name of the pattern, the maker, the fabric content, the origin and a notation - made in America. A little beauty that can be easily made in custom colors of your choice. Lovely! 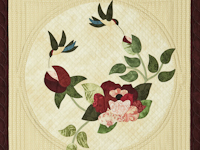 A favorite C Jean Horst design now available in a size small enough to fit on most any wall. 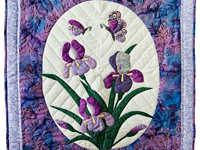 Beautiful applique work and lots of fine quilting. 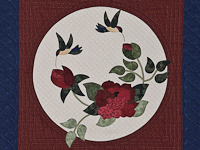 The Roses and the little pair of humming birds make this piece a remarkable show of hand appliquéd work. Made here in Lancaster. Includes a sleeve for the convenience of a hanging rod. This little quilt also has a small documentation tag sewn into the back corner of the name of the quilt, it's maker, location, date and a note about being quilted by an Amish quilting friend. It has a wonderful amount of hand quilting and has approximately 7 stitches per inch. It also has a neutral backing to blend with the front of the quilt. An nice art piece for a small space! 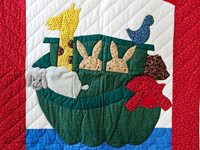 A charming quilt showing some the happy animals that found a place on Noah's Ark. Nice appliqué work and quilting. Made by Amish woman in her Lancaster County, Pennsylvania home.